Facebook is hosting the F8 Developer Conference in San Francisco on Wednesday, April 30th at 9:30am a.m. PT. Join senior writer Austin Carr for live updates from the day-long event, accompanied by commentary from Fast Company senior writers and editors in Chicago and New York. Anonymous Login lets users try apps out anonymously, and sign in with their real information later if they decide they like it. AppLinks allow users to slide seamlessly from app to app--it's essentially deep-linking between apps. Facebook finally unrolled a Mobile Like button. Facebook Audience Network helps developers take advantage of Facebook's ad platform on mobile, so they don't have to put so much energy toward audience targeting, analytics, and so forth. Good morning, everyone. 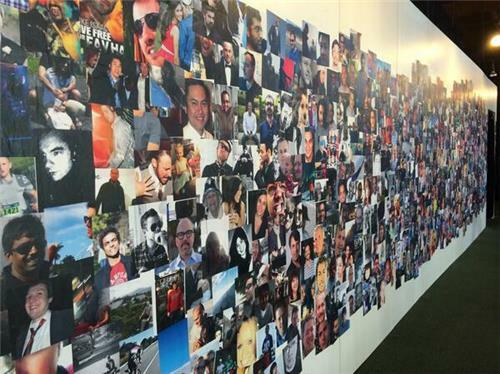 We're gearing up for Facebook's F8 conference today. First on the agenda: a keynote by Facebook founder Mark Zuckerberg at 10am Pacific. 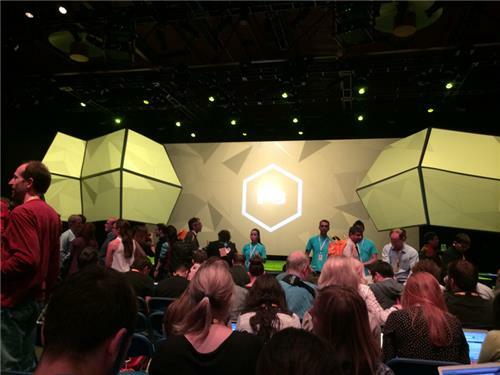 Fast Company's Austin Carr is at the event in San Francisco and will be bringing you live updates. 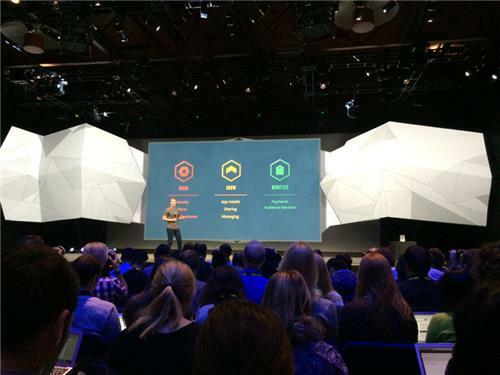 Facebook hasn't held an f8 conference since 2011, when it unveiled a new Open Graph and Timeline. 21 speakers on the F8 agenda today -- but only four of them are women: Stephanie Shum, Allison Swope, and Sharon Zeng are product managers, and Bear Douglas is a developer advocate who will be providing an overview of Parse, the cloud-based app development platform which Facebook acquired last year. Good morning, y'all. We've arrived at Facebook's f8 event in San Francisco, where even at 9:50 a.m., the place is packed from wall-to-wall with developers and reporters (and likely a few people who just snuck in for the free food). There are Oculus testing stations all around, engineers offering advice, and a sense of anticipation for CEO Mark Zuckerberg's keynote, which begins in just 10 minutes. Facebook is clearly sparing no expense with f8 today. 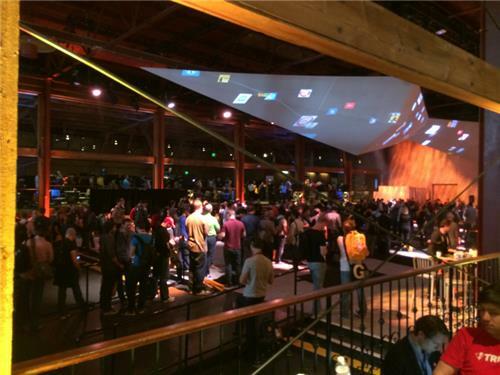 The livestream is a fully-produced channel, with a host and studio for interviews and analysis; the event lobby has a custom art installation; the food will be the same as is available on Facebook's Menlo Park campus; there is a gaming lounge as well as 4 Oculus stations for attendees to experience virtual-reality gaming; and the event stage backdrop is some kind of live map that will pulse and change using light. Mobile Like is actually a better deep linking idea in apps than the Applinks product. You aren't alone. I had no clue that mobile sites DIDN'T already have a Facebook Like button, either. Apparently you could "share" but not "like" something. Archibong also introduces a "sent to mobile" feature for the desktop, so when a user logins or installs an app with Facebook on a desktop, Facebook will give you the option to send a notification/reminder to your smartphone, to download the mobile app too. Facebook has also introduced FB Start. It's a program that will give $5,000 in free services to startups getting off the ground, and $30,000 in free services to accelerate growth for more mature startups. Facebook once had FB Fund which was a seed-stage investment for Facebook Platform companies. TaskRabbit is probably the most famous FB Fund recipient. Now Facebook has this Start program to offer developers tools and up to $30,000 to get started. This thing is so damn heavy. Austin, wow. Looks like you're wearing one of those lucite things they give out when you ship a product. Facebook's updates today, overall, feel like they're breaking the walls down between platforms. Hear me out. The Like button is now on mobiles and desktops. Links embedded within apps can quickly take you from one app to another app. There's also an option to send yourself a push notification, from Facebook desktop, to download an app on your phone. It's not just about merging desktop and mobile (but that's part of it). It's about getting rid of platform distinctions and points of friction when hopping around websites and apps. 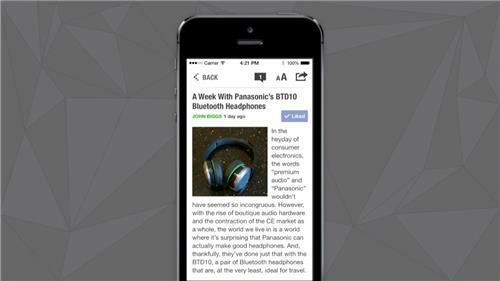 Facebook wants to be your wiring to everything you want within the digital world. Deb Liu, of FB Platform products, comes on stage to talk about “making a little money” on FB. "Money is the lifeblood of your business," Liu says. Well, tell that to devs at revenue-free startups likely in the audience. Deb Liu on stage - so I guess that makes her a 5th female speaker at the event today (at least 4 more coming up). Liu: 375 million people play games with Facebook each month. Liu now talking about Facebook's own troubles making money in mobile. Despite having the top apps in iOS and Android, "We made no money," she says. "We needed to solve this problem for ourselves...we couldn't just take our right-hand side ads and move them to mobile". Two years later, however, the company boasts a billion users on mobile, with 60% of its ad revenue generated from mobile. Liu now contending that she loves to see the beautiful ads in her news feed when she wakes up in the morning. Outside that Taco Bell ad Instagram recently featured in your feed, how do y'all feel about Facebook's native ads? Liu introduces the Facebook Audience Network. Liu: "We've brought it all together for you so you don't have to hire a giant sales team to sell ads". Liu: "It's all done for you". The Facebook Audience Network essentially allows developers to take advantage of Facebook's ad platform on mobile, so they don't have to worry about audience targeting, analytics, and so forth -- Liu says FB will take care of it for you. "It’s the best experience for advertisers because they’re getting the ROI they’re looking for," while devs have an “easier time getting these ads in their system”. And Zuck is back on stage. “One thing you didn’t hear was completely new shiny product from us because today is all about you and listening to you and deepening how we support you”. 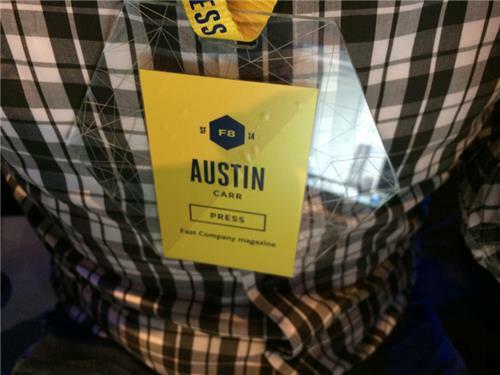 Zuck announced f8 next year, 3.25.2015 at Fort Mason. He says you can expect f8 to be more regular occurrence, around this time each year. Zuck says they have more than a million active advertisers that are just waiting for your apps. Zuck now concluding on a personal note, turning 30, 10 year anniversary of FB, and 10 year anniversary of when he met his wife. Zuck is talking about bringing the hacker culture to the next 10 years of Facebook. And Zuck's keynote comes to a close, ending by saying he wants to help developers build on Facebook platform. All right, that's all for now folks. But there will be other interesting talks throughout the day, so stay tuned!